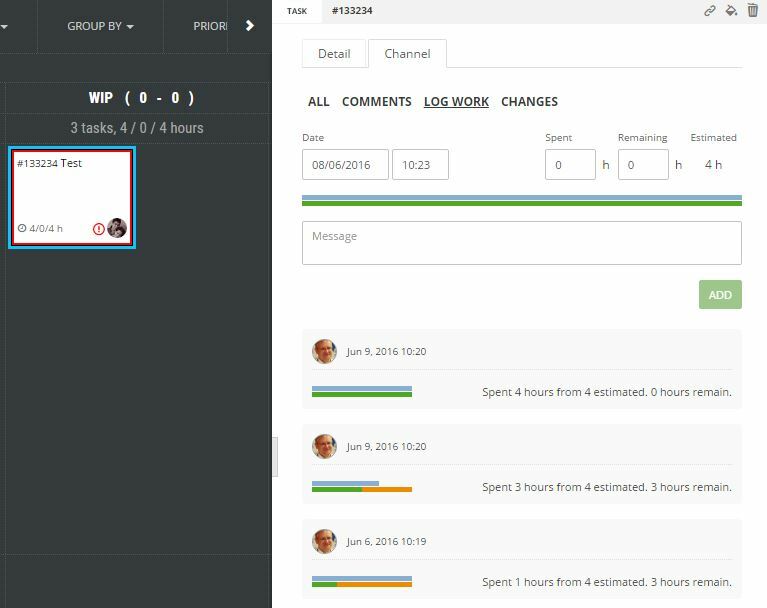 ScrumDesk allows tracking time on subtasks in hours. Work logs are available in the side view where new log entry can be added or removed incorrect one. Remaining time to evaluate remaining work necessary for completion of the task. ScrumDesk will also calculate it based on estimation and time spent, but consider to validate this proposed value so your burn down chart will be correct. The message allows to describe, comment, work log entry. orange bar indicates the remaining time. If everything runs well, then Remaining time = Estimated – Spent. But this is not always true. ScrumDesk indicates if work takes shorter, or longer than estimated. Work goes well. We spent 1 hour on a task and 3 still remain. Total time is still the same as estimated. We slowed down. Even we spent 3 hours, we realized that we will need additional 3 hours for completion of the task. Therefore total time will be longer than estimated time. Work goes very well. We spent 2 hours and expect 1 hour to finish the work even we estimated it for 4 hours. We will need less time than estimated. Work went very well and the task is completed. The total spent time is shorter than estimated. All work on the task is completed. We spent the same amount of time as estimated. ScrumDesk doesn’t support editing of work log entries. Work log entry can be however deleted and added correctly once again. Only an author of the work log entry, or ScrumMaster, can delete work log entry. When deleted, the time will be updated on task card as well. All work log entries will be sorted accordingly.